Since yesterday, a video of the superstar Rajinikanth is going viral where he is seen dancing to the famous song Oruvan Oruvan Mudhalali from the film Muthu. It was Soundarya's sangeet ceremony where only close relatives and friends were invited. 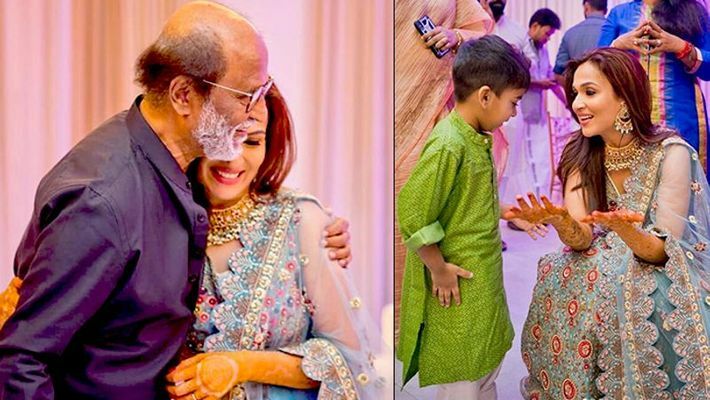 Soundarya took to social media to share the inside pictures from the reception and from the look of it, we can say the family had a gala time. Take a look. Sharing the stills from the ceremonies, the official photographers wrote, "Happiness, unplugged. The calm before what was one of the most amazing sangeets we could ever imagine shooting. Not every day do you get the superstar @rajinikanth to break a leg on the dance floor." Soundarya also shared music composer Anirudh Ravichander's picture from the pre-wedding bash. An adorable picture of Aishwarya and Soundarya with sisters Sridevi Vijayakumar and Preetha Vijayakumar also took the limelight and was shared on social media. Soundarya's make-up artist, Prakruthi Ananth took to her social media page and posted the bride’s messy braids and flawless look. Soundarya was seen in a striking blue and gold sari, Vishagan stuck to a white shirt and veshti (dhoti). Both were dressed in western semi-formals during the party.